RCS, commonly known as thrusters, is an essential system for spacecraft navigation. Rosatom-Antonow K37-TNTRL operates with reactor-powered hydrogen dioxide based exhaust allowing up to 200kN of thrust per unit – more than enough for agile maneuvers even with full load. Pilots should be warned that RCS exhausts irradiated gas at over 3000K, making it unsuitable near inhabited planetary bodies and stations. In such conditions supplementary RCS is advised. This marks an important milestone in development of ΔV. It is officially a game prototype now. You can actually play it and fly around the ring. 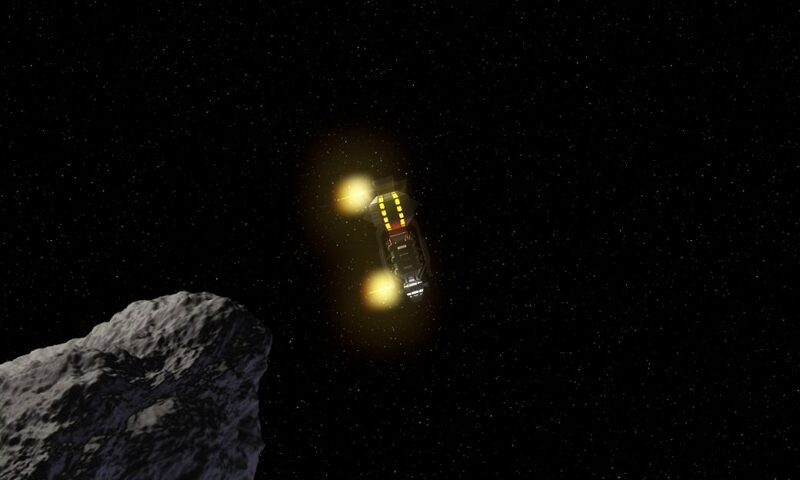 I’m using real physics to move the ship, with thruster powers as specified. Researching actual data before creating model paid off – even if I needed to spend few minutes translating this to Godot’s physics engine internal units. Player has controls over the thrusters, and they exert forces as specified. Initially I assumed smoot gameplay will need for some autopilot-like player augmentation, but even with simplest control over thrusters ΔV is surprisingly playable. I was about to take a quick video and ended up flying around the field for over an hour. Current build also adds HDR, auto-exposure and bloom effects. It still needs some tweaking, but effect itself looks promising. Using plain top-down view paid off on the prototype – player can make very precise maneuvers, opening up opportunities for docking gameplay. Next step – impact damage.